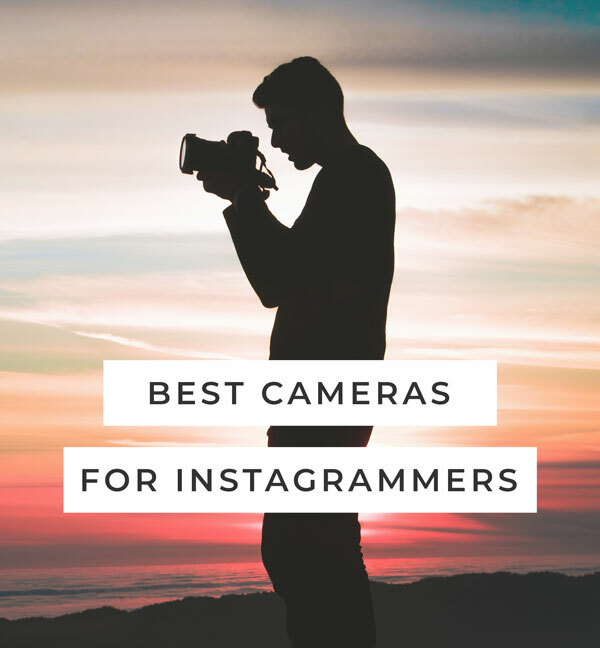 One of the best things you can do to improve your Instagram feed is to get a better camera, here are the best cameras for Instagram. Using a smartphone can be great for taking photos and posting to Instagram. But we know a lot of users will outgrow their smartphone and want a mirrorless or DSLR camera to step up their IG game. When you get a camera with interchangeable lenses it’ll also allow you to change aperture, shutter speed, iso, and plenty of other settings to perfect your photos. Once you’ve made the decision to upgrade your camera it can be hard to choose the perfect camera. Choosing a high quality camera can last you years, we’ve compiled the best camera for Instagrammers. Things like weight, price, and functionality can vary between cameras so be sure to review all of our options. Paying a few extra hundred dollars now can increase the longevity of your camera in the future. First let’s note the biggest differences between mirrorless cameras and DSLRs. Selecting this is an important part since it’ll affect the overall experience with a camera. Mirrorless: Smaller, lightweight, more modern features, and accurate viewfinder previews. DSLR: Larger, heavier, better battery life, and better autofocus systems. Whether you’re posting on Instagram, printing photos, or need a camera for social media all of these cameras are great for capturing the moments from your adventures. If you’re a blogger these cameras will also improve your blog‘s photos. This is a no brainer, if you’re on Instagram you already have a smartphone. 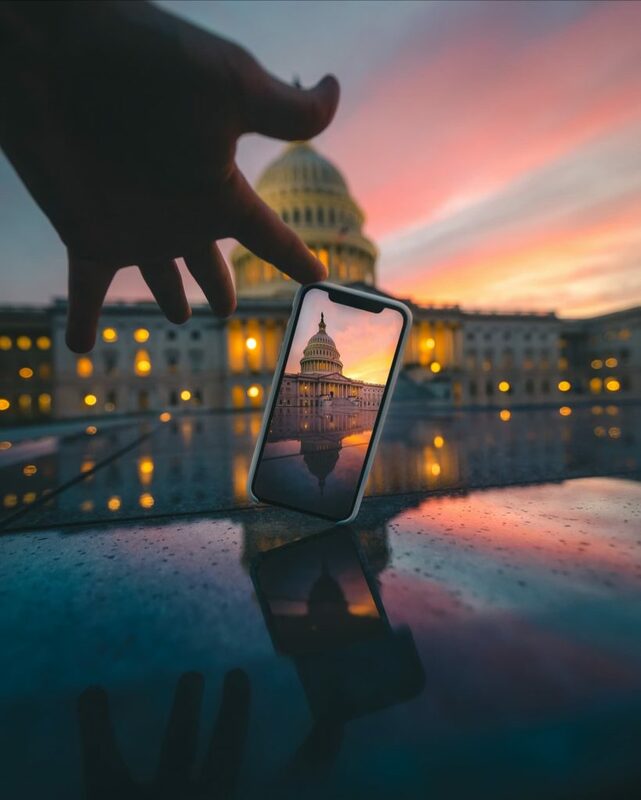 Some of the best smartphone cameras include the iPhone XS, Google Pixel 2, and Samsung S10. These are all great choices just in case you’re looking to upgrade your mobile photography. Plus using your smartphone camera is of course the easiest way to take photos and upload to Instagram. It is possible to upload to instagram from a PC or Mac but we love using the app to post. Most of all you don’t want to miss out posting stories and using direct messages which is best done by using the native app. iPhone Lenses: If you want to level up your mobile photography the Moment lenses are incredible. It’s a fantastic way to get a wide angle or telephoto lens on your phone. It’s also a way to make your Instagram stories more fun by showing a wider angle story to your audience. Editing Apps: Some apps we recommend to edit your photos include Snapseed, Adobe Lightroom CC, and VSCO. Additionally the tools and filters built into Instagram are very useful at this point. If you’re looking to improve your photography starting with editing is a good idea since the skill will translate into any camera you’re using. If you want to learn more about mobile photo editing you can find plenty of free videos on YouTube or structured courses on Skillshare. Shooting RAW Photos on Mobile: Additionally you can take more control over your mobile photography by shooting RAW with apps like Lightroom CC or Halide on iOS. Shooting photos in RAW will give you more data to work with while editing rather than the phone making all of the decisions. Many camera apps also let you manually control things like exposure, shutter speed, ISO, and aperture. Sony’s mirrorless cameras have taken the market by storm and now are extremely popular. Sony cameras are known for their small form factor and great image quality. People love the α6000’s fast 11 frames per second RAW shooting and quick auto focus. Since Sony has released the newer α6300, α6400, and α6500 you can find the α6000 for a great price. The Sony α6000 has a fantastic screen for shooting with live view which makes for an easier transition from smartphone shooting. Since you’ll be using a screen to shoot photos you’ll see exactly how your photo will turn out. Unlike DSLRs which use a mirror when shooting through the viewfinder that can lead to unexpected results for beginners. The α6000 hits a real sweet spot between price, image quality, and portability. It weighs about the same as a bottle of water yet delivers pro-quality photos for easily under $1k. The lightweight and small form factor of the Sony α6000 line makes it great to throw into a bag so you always have it ready at all times, making it the perfect camera for a travel photographer! The α6000 includes a tilting LCD screen on the back as well. The tilting screen is perfect for taking photos high up or low to the ground without laying on the ground. The screen only tilts and doesn’t flip to the front which would have been a nice option for selfies and vlogging. Wifi is also included in the α6000 which makes it super simple to grab images from the camera using the Sony PlayMemories App. Wifi is a great feature for beginners who are familiar with editing and posting form their phone. This is why we recommend cameras with wifi since it can be cumbersome to use a computer for uploading. The Wifi capability also allows you to get apps through the PlayMemories app for the camera including things like long exposure, time-lapse and night-photography. Additionally it has NFC built in for transferring photos with a tap to Android phones. The battery life for the α6000 is about ~310 photos. This is a downside of most mirrorless cameras but the batteries are tiny so you can pack a few in your bag. So if you plan on buying this camera we recommend picking up a few extra batteries. Plus you can charge the battery using a USB cable (or he included AC adapter) which is great since you don’t have to pack another battery charger in your bag. $$$ If you have a larger budget you can get a Sony α6300, α6400 (newly released), or the higher end α6500. Sony α6300: The α6300 improved the auto focus system over the α6000 in addition to better ISO performance and 4k video shooting. Plus it included the addition of a touchscreen. Sony α6500: The α6500 offers high-end features like in-camera image stabilization which can be useful in low light situations and for video. Plus it has improved ISO performance and auto focus over the α6000. Additionally it includes a touch screen. Sony α6400: The newest camera in the series has all of Sony’s latest features like an improved focus system (better than the α6300 and α6500), larger ISO range which is better for low light. It does lack the in body stabilization of the α6500 which is an odd design choice by Sony. The screen also flips upward so you can see yourself while shooting, perfect for vlogging but it’ll be blocked if you use a microphone. 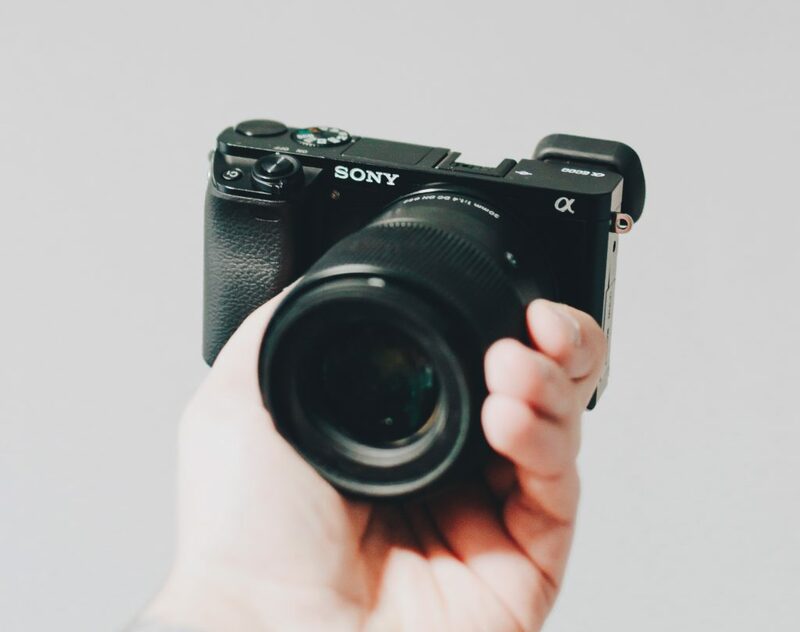 If you are more on the professional side and desire the highest quality possible the Sony α7R II and the newly released Sony α7 III are the best mirrorless cameras for Instagram. The Sony α7 series features full-frame sensors that will result in incredible photos. Full frame cameras generally have improved low light performance, better dynamic range for editing, and produce high quality images overall. When I decided to purchase a “big-girl” camera I went to the Sony α7R II. I have never been disappointed either. The α7RII has an incredibly powerful 42mp sensor so shooting in RAW brings out every colorful detail of your picture. The G Master lenses are expensive, but worth the investment. My favorite all around city lens is the GM 16-35mm. It is my “go to” lens. The high ISO is crazy good (I’ve taken at 12,800 ISO) and thanks to its amazing pixel count, what noise there might be, is hidden. Its viewfinder is great, and the camera itself is comfortable to hold. It’s sturdy and well made. I have never regretted my choice. The α7R II and α7R III are great choices if you need the massive 42 megapixels but for most travel photographers on Instagram the more reasonably priced α7 III is the best camera available. With incredible image quality, wifi transfer, and compact body you’ll never want this camera to leave your side. Sony also offers a high end line of lenses called G Master (GM). These lenses in combination with the full-frame sensor will offer some of the highest quality images for consumers. GM lenses include a drive mechanism for optimal autofocus performance. All of the G Master lenses are also dust and moisture resistance which can be useful when traveling in harsh conditions. Many photographers who convert from Canon to Sony will pick up an adapter to convert their Canon lenses to the Sony E-mount system. A few companies make adapters such as Metabones but a lot of users report some performance issues making it ideal to use Sony lenses exclusively. The sony α7 III also has a weather sealed body so thing like rain and snow shouldn’t be an issue for the camera. 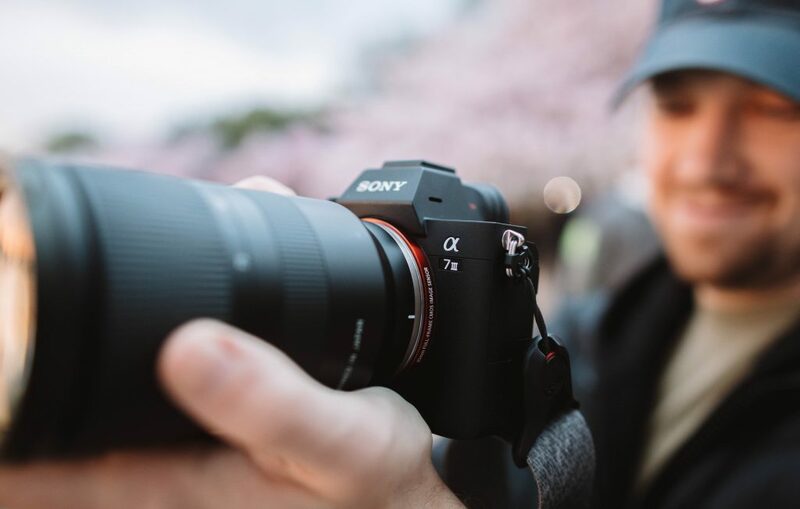 With 24.2 megapixels and amazing dynamic range the Sony α7 III will meet all of your Instagram photography needs. Especially since you can quickly transfer photos off (including RAW files) into mobile editing apps like Lightroom CC. People love Canon camera because of their massive lens selection and fantastic image quality & color science. The Canon T6i is a great introduction to the Canon ecosystem. Some users prefer using a DSLR since you take photos through a viewfinder that uses a mirror. With a flippable screen and touch screen it’ll give you many features you’re used to using on a smartphone. One downside is that focusing in videos and using the screen (live view) can be slow since it lacks dual pixel autofocus. So you’ll most likely be using the optical viewfinder to enjoy its fast focus system. Many newer Canon cameras offer dual pixel technology which makes focusing using the screen much faster. If you’re using the viewfinder (which is a benefit of DSLRs) you’ll get about ~450 photo battery life. If you use live view to shoot your battery life will be crushed to ~200 photos. On the downside the T6i doesn’t include some of the newer Canon features like dual pixel autofocus which can be found in the Canon 80D and M50. Dual pixel autofocus add incredible autofocus when using live view, the T7i offers dual pixel autofocus. We recommend picking up a Canon camera with dual pixel autofocus if you plan on filming a lot of videos since videos can only be shot in live view. With the T6i’s built in wifi you’ll enjoy editing and uploading to Instagram on the go. You can grab your photos from any Canon camera using the Canon Camera Connect app which will allow you to download images and take photos from a distance. If you’re looking at getting the Canon T6 we think the extra money is worth the extra features in the Canon T6i. These improved features include a touch screen, articulating screen, 24 megapixels instead of 18mp, better image quality, and improved auto focus. $$$ If you have a larger budget you could pick up a Canon T7i, Canon M50, or Canon 80D. All of these include Canon’s fantastic dual pixel autofocus system that makes shooting with liveview optimal. Canon T7i: The Canon T7i has a better autofocus system when using the viewfinder and live view due to more autofocus points and dual pixel autofocus. Additionally it includes a fast burst system of 6fps, longer battery life and improved ISO performance. Canon M50: If you’re looking for a smaller camera from Canon the M50 has become a great choice due to its mirrorless body, 10fps shooting, improved ISO range and large lens selection. Canon 80D: The Canon 80D is a pro level camera with its weather sealed body, incredible ISO, ~960 shot battery life, and great auto focus. Many professional photographers use the Canon 1DX Mark II, this is an incredible camera but is huge and expensive. The Canon 5D Mark IV offers most of the features of the 1DX Mark II but in a smaller body. This makes it the best travel camera DSLR. If you have a smaller budget the Canon 6D Mark II is a great choice plus it has a fully articulating flip screen making it a great option for vloggers. The Canon 5D Mark IV is used by tons of Instagrammers who enjoy the 30.4 megapixel photos, great dynamic range, and wifi capabilities. Many users flock to Canon since they have a massive lens selection of over 200 lenses. Including unique offerings like tilt-shift lenses which allow you to control the depth of field and perspective of a photo. Canon’s high end series of lenses are called L series, notably these are the ones with a red ring around the front of the lens. All L series lenses are designed to be weather sealed and are built for professional use. Canon’s 5D line also has some of the best weather sealing of any camera company. So if you get caught out in the rain or snow you won’t have to worry about your camera being damaged since it’s weather sealed. Additionally the Canon 5D Mark IV has fantastic video quality. This is perfect for uploading to your stories, IGTV or even as posts. One of my favorite features is the ability to do timelapses inside the camera. So you won’t have to worry about putting hundreds of images together since the camera can do it all for you. If you want to learn more about professional timelapses the 5D Mark IV also includes a built in intervalometer which will takes photos every X seconds so you can edit the photos together on your computer. If you’re looking for a high end mirrorless camera from Canon they also make the Canon EOS R which has most of the premium features of the 5D Mark IV but in a smaller mirrorless body. Canon has only released a handful of lenses for this new RF mount system so you’ll probably want to pick up the EOS R adapter to use all of Canon’s lenses. 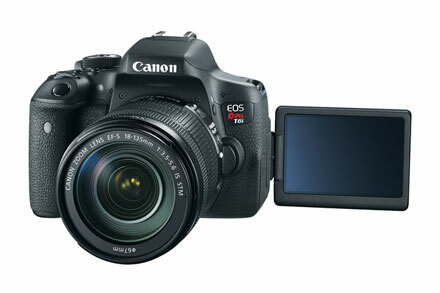 Canon has also recently released the Canon EOS RP which is a fantastic value at only $1300 for a full frame mirrorless. 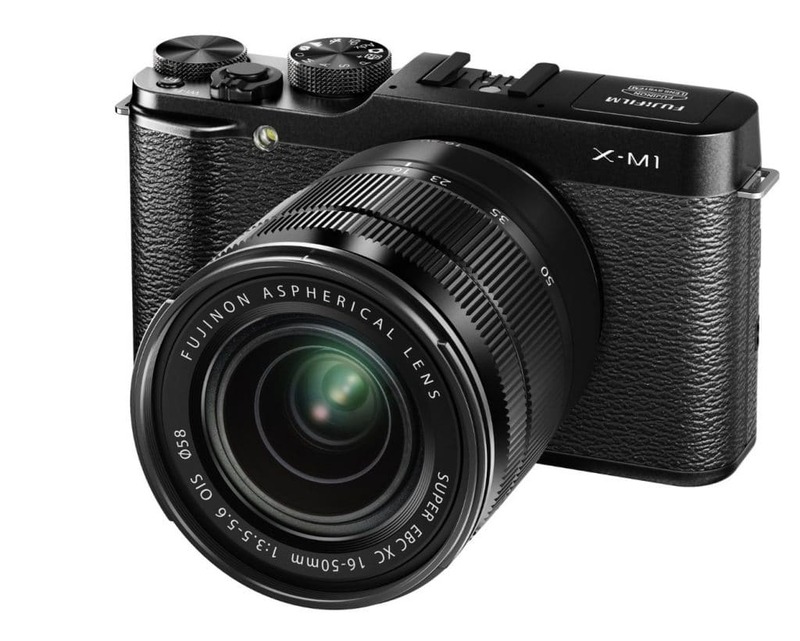 Alternatively you can pick up the Fuji X-M1 if you want something a bit different. Some stand out features include Wifi and larger sensor. For its price it’s a great way to learn the basics of photography without breaking the bank. The X-M1 also includes a tiltable screen, built-in wifi, and a large sensor in a very small body. Plus it’s hard to resist Fujifilm’s vintage style body. The Fuji X-M1 also includes 1080p recording at 30fps which can come in handy if you plan on shooting videos. Some note that the auto focus can be a tad slow compared to other mirrorless cameras and some of the dials are awkwardly placed. Those cons aside the X-M1 offers excellent image quality, low noise at high ISOs, quick start up, and a tiltable LCD screen. $$$ Upgrade If you have a higher budget the Fujifilm X-T100 with its tilt/flip screen, touchscreen, and 24 megapixel sensor is also a great alternative to the X-M1. Additionally the Fujifilm X-T20 is also a great choice with more modern features. If you have more rugged adventures and you can’t beat the image quality, size, and waterproofing of the GoPro HERO7. Best of all you can transfer your photos and videos to your phone with the built in wifi. Plus if you want to heavily edit your photos the HERO7 will even let you capture raw photos. HyperSmooth Video Stabilization: This simulates gimbal-like stabilization all without a gimbal to make your footage ultra smooth. Super Photo Mode: HERO7 will automatically apply HDR, tone mapping, and noise reduction to create an optimal photo; all in camera. Voice Controls: Use your voice to take photos, start recording and more. 4K60 FPS video + 12MP Photos: With stunning 4k video and 12 megapixel photos all of your footage will look fantastic on Instagram. Waterproof: The GoPro HERO7 is designed to be as rugged as possible, its waterproof body make it fantastic for trips to the beach. Check out some of the best GoPro photography on GoPro’s Instagram account. 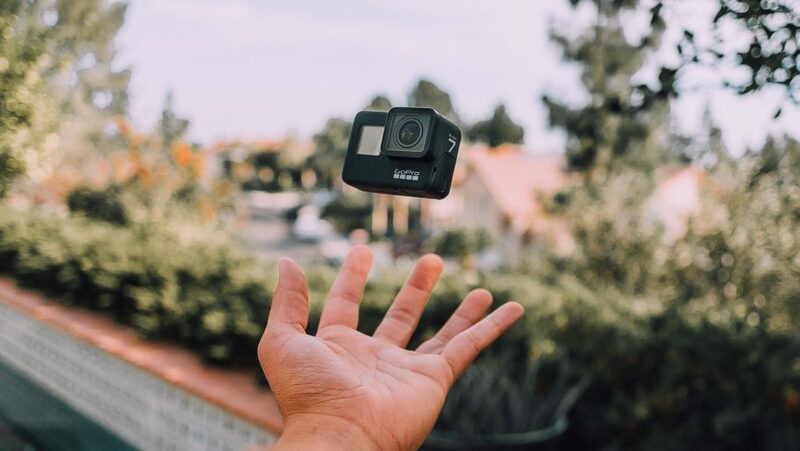 Even if you don’t plan on taking adventurous photos the wide angle photos from the GoPro will give you ample creative opportunities for your feed. If you’re starting out, the kit lenses (lenses bundled with the camera) are typically good quality. They usually offer a great range of focal length for all types of photography. After learning how the camera works using the kit lens we highly recommend upgrading to a 50mm prime (great for portraits!). You can usually pick one up for around $100 and most camera companies make an affordable 50mm for their cameras. Prime lenses will give you lower f stops so you have greater control of the depth of field in your photos. Shallow depth of field is often used in artsy photos especially when taking portraits. Plus if you pair a shallow depth of field with unique lights like fairy lights you can achieve some interesting effects. Once you figure out your style and what you like to shoot buying more lenses can improve the direction you’re heading. Wide angle lenses (~16mm) can be great for landscapes and cityscape photography while telephoto lenses (~50mm) are ideal for portraits. On a side note, without adaptors, lenses aren’t interchangeable between companies. This is something to consider before you get heavily invested into a camera brand. Crop Factors: Just to note, all focal lengths noted above are assume you’re using a full frame camera (35mm). To calculate the focal length to a cropped sensor you can use a took like mmCalc. So for example a 16mm lens on a micro four thirds camera will actually be 32mm so that is something to consider when looking up lenses. We recommend reading reviews of lenses to full see what you’re going to get. After getting a camera here are popular items photographers use to up their Instagram photos. This includes a tripod which is essential for long exposure photos, backpacks, and interesting props for your photos. Tripod: If you plan on doing a lot of night photography a tripod will be essential to capturing long exposures and share images at night. When buying a tripod be sure to check the maximum load and if your camera is below the max weight. Backpack: When you acquire more lenses a bag to carry all of your gear is important. Plenty of companies make camera bags but Peak Design is a popular choice for many photographers. Instagram Props: Popular items Instagrammers place in their photos include a Lensball, Prisms, Fairy Lights, and the Moon Light. These have become very popular on Instagram being used by huge photographers like @brandonwoelfel. A single camera won’t be the best option for everyone but balancing the size, budget, and features all of these cameras will take fantastic cameras. Hopefully these cameras and gear will improve your Instagram feed. If you’re still trying to improve your photography we recommend checking out Skillshare and watching free videos on YouTube. Learning to perfect your editing can also greatly improve your photos. Let us know your thoughts and what you shoot on in the comments!